The light is returning to the northern hemsiphere. Signs of spring suggest themselves timidly as the warming afternoon sun rises ever higher. 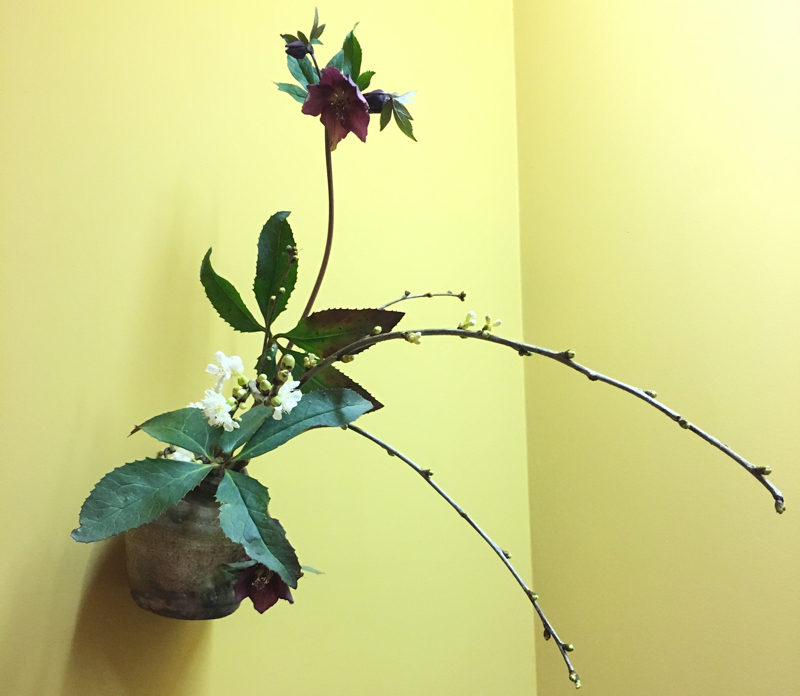 Yesterday I saw cherry blossoms at a friend’s, brought inside (buds tight and hard) from the cold a few weeks before. There they were perched in an antique vase together with the bold purple hellebores just brought in from the cold, the very cure for the winter blues. This simple flower arrangement was the perfect expression of love in winter. Under this vase we practiced meditation. In this meditation session, which we practice once a week on Monday nights, we read from the Zen master Suzuki Roshi. He said (I paraphrase), “Meditation is not just focusing on one thing. For example, the great bodhisattva Avalokiteshvara, who has 1,000 arms… if she is focusing on just one arm, what good are the other 999?” I think Suzuki Roshi was talking about the love of everything where we glimpse the play of the floating world around us, even as we focus on the breath. We practice love in winter where the world may seem frozen but there are 999 details to love within the breaths. It’s Valentines Day. 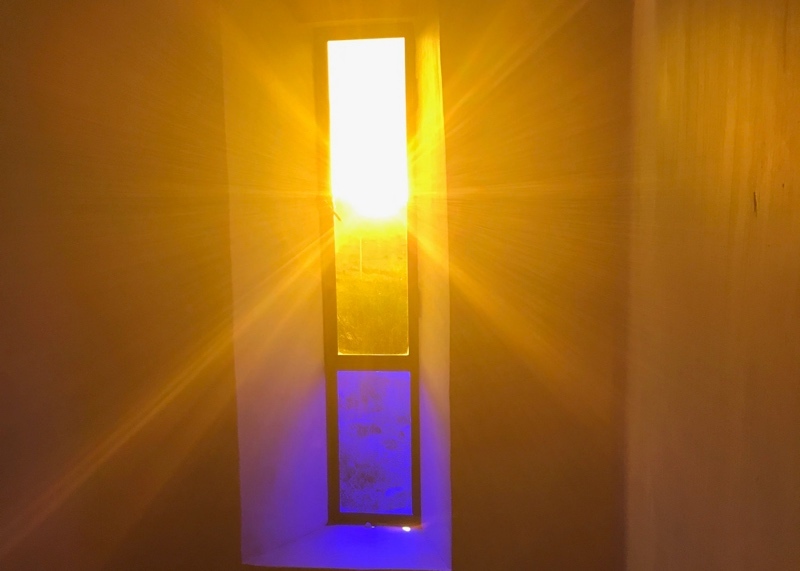 It’s also the new year and the light is returning with greater strength day by day. Love in winter is sun which just shines. Not my sun or your sun, it is just so as my inspiration rises. One thousand hearts are floating in the cold air as the day vibrates with crystalline clarity. Not my hearts but the hearts of love in winter. Penetrating hearts from my heart which is warm, and pulsating in every direction like the ultrasound I saw it in last Tuesday down at the clinic. Valentines Day love in winter. Meditation in winter brought love where I hung on the breath a little. This kind of love in winter is true love. Like when I caught my true love’s reflection when she didn’t notice I was looking. The first rays of morning sun came through at 10:43 today so I put on the sunglasses and looked cool. I touched the outbreath a bit more, felt the sun burn. I felt that kind of solemn march into the infinite but then didn’t care. It’s just meditation in winter stuff where you just sit there feeling loved by the 1,000 circumstances that brought you there. So the winter valentine has brought me true love. Did you see her? She is right there, there where the sun is shining in the cracks of trees in the winter sky. She is life itself. She came skiing down the slopes of the outbreath then split into a thousand pieces. She is love in winter. Join one of our Morocco Retreats for meditation, yoga, sound healing and the love of life. Next retreats are 18 – 24 March & 6 – 12 May, 2018. ← New Years Resolutions or New Years Aspirations?